Parenthetical Thoughts | 26, just married, detailing my journey to figure out WTF I am doing with my life and the distractions along the way. 26, just married, detailing my journey to figure out WTF I am doing with my life and the distractions along the way. My friend Greta is a bit of a genius when it comes to unearthing the worst (i.e. best) music from the past few decades. Through her expert mix cds that she surreptitiously leaves in my car she gets me hooked on this stuff to the point where there is no hint of irony in my love for artists like Styx, Billy Ocean and America. During my freshman year of high school, my best friend and I had an ongoing and not very fruitful debate about who was hotter/more awesome: Eddie Vedder (who had long hair and played music and thus was the essence of hotness in my fourteen-year-old mind) or Matthew McConaughey, whom my friend preferred. A Time to Kill had come out that summer and Matthew McConaughey was a rising star, though too beefcakey and blond for my taste at the time. Fourteen years later, I’ve gotta call it a draw in the Vedder/McConaughey debate. It’s clear McConaughey’s got something special going on, though I almost wish he had become a character actor instead of a leading man. I think he’s a lot more appealing and funny this way. 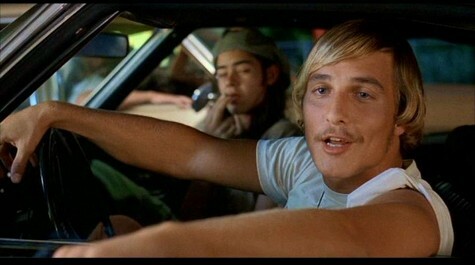 On a side note, Dazed and Confused came out in 1993, seventeen years after it was set (in 1976). It’s been seventeen years since 1993. I think it’s time for a Linklater nostalgic high school film set in the early nineties with another crop of undiscovered talent. Good developments in my life: I’ve given notice at both my menial labor jobs, and found a new corporate one that is somewhat library related. I’m mainly excited to utilize the cute outfit section of my closet that’s gone untouched for the last 6+ months. The spring semester has started as of yesterday, I’m hosting my book group tonight (the book is Tipping the Velvet, by Sarah Waters), and if I’m going to be doing any blogging this afternoon, it should be for the library blog that I’ve been neglecting. Despite all the stuff I should be doing, all I want to do is relax. I have two part-time jobs (one every weekday morning for about an hour and a half, and the other three days a week, 4 hours each day) and they are exhausting. They are both working for women with disabilities, and though one is more personal care and the other more cooking/cleaning, they are both physically demanding. It’s hard to come home from making chicken enchiladas and mopping someone else’s floor and want to cook myself dinner and clean my own house. I also have to get up at 5am Monday through Friday for the morning job. Occasionally earlier. This morning I popped out of bed (for some reason I have no problem getting up – it’s the late afternoon that kills me) at 4:45am. I’m happy to be able to eke out a modest living. I’m equally happy that I have a spouse who toils away at a teaching job that offers health care so that I can do part-time gigs while I work my way through graduate school. And finally, I’m happy to have the opportunity to work for two very nice women (both around my age) and to get the chance to learn a thing or two about what it’s like to have a disability. It’s been a long time since I’ve done non-desk work, and while I’m grateful for any time spent away from my computer, I feel like all over muscle fatigue trumps eye and wrist fatigue. All I’m saying is, I’m tired. Posted in Career, WTF am I doing with my life? I’ve applied for two jobs in the past few weeks where the employer has had a severe allergy to scents (not just perfume but scented shampoo, soap, lotion, candles, air fresheners, and just about anything that has any kind of smell to it). One sent me a memo explaining that she experiences “mini-strokes” and even brain damage if she comes close to someone wearing a scented product. In order to work for her, not only would I have to give up all scented products all the time, but I would have to detox my wardrobe, towels, sheets, car, and so on and so forth. Clothing detox basically involves about four washing machine cycles per load of clothing – once just for the machine (with baking soda only) and three times for the clothes themselves. All this for $15 an hour. I keep getting myself into these situations where I think I can make this kind of lifestyle change, that I’m not that into toxic products to begin with, but when I learn about the details it just starts to seem insane. No painting my toe nails? No fabric softener, EVER? I have to choose from the brands of deodorant you’ve provided on your memo and submit to someone “sniffing” me before I can enter your house? Note the richness of the hair color… I dig it. And I guess the point of all of this is to say I’m sabotaging (whether on purpose or not is still unclear to me) my chances of getting a job in Berkeley by indulging my new-found chemical dependence. I guess it’s better to realize that now, instead of finding myself trapped in a dead-end job where I can’t change my hair color (or brand of deodorant) without getting fired. Posted in WTF am I doing with my life? This summer has been full of ups and downs, but was helped along by the awesome opportunity to spend almost two months in Montana hanging out with in-laws, helping out around the house (as various health crises occured), going backpacking and visiting friends. Things kicked off in California with a super fun weekend of celebration at the wedding of one of my best friends. All the beauty and good feelings made me want to go back to being engaged and having a whole wedding ahead of me to plan. Perhaps this is because my wedding was over a year ago, and I’ve forgotten what it’s like to be planning. It was a blast to camp at 10,000 feet, and a total kick to have the pooches along. They loooved the tent. I even managed to finish 3 courses for library school this summer – one in Perl programming (I earned that A-, lemme tell you), an independent research project about emerging careers in library science, and a class about ‘picture books for older readers.’ We’re starting the 2-day drive back to Oakland on Sunday, and fall classes start on Monday. And after months of loafing around, it’s finally time to start looking for a job… if one exists. And I really like it. It’s got the usual jumping business that Jillian seems to love, but it’s also got a lot of kickboxing moves, which I really enjoy. There’s a lot of oblique work, as well as standing ab stuff, which is a nice change from Pilates. A major bonus is that it’s a full 40 minutes (not including warm up/cool down), which, if you’ve done any Jillian Michaels videos in the past, you know is a LONG time to be working out. It’s a great way to mix up the Shred workouts (which, to be honest, I haven’t done in a long while) and to give the ol’ quads a break (though be warned, there is one circuit that just might kill your quads – I sometimes skip it). This is my favorite workout right now, as it gives me that calm/endorphin rush feeling I used to get after running long distances. And let’s be honest, I enjoy all the punching, kicking, and knee-thrusts.